If there’s a plus side to not jumping on to the USB 3.0 bandwagon just yet, it has got to be that USB 2.0 flash drives have started to get really cheap to compensate for the competition. Sure USB 3.0 drives still boast incredible read and write speeds that the earlier edition drives can never reach, but at least you can take advantage of the drop in prices. That means extra storage without causing a big dent in your wallet. That’s not so bad, especially when one of the USB 2.0 drives in question is the Patriot Xporter XT Rage 32GB. 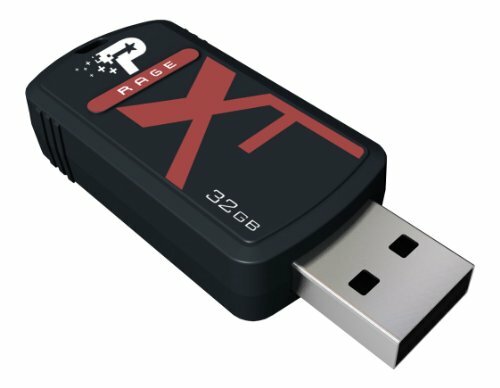 When it was first released, the Patriot Xporter XT Rage 32GB was sporting a price of $59.99. If you do the math, that comes out costing you $1.87 per GB. Now, the flash drive’s selling price has come all the way down to $32, a $27.99 deduction from the original, which brings the cost per GB to $1. That’s a pretty good offer considering the features that come with the Patriot Xporter XT Rage line of USB flash drives. Patriot Memory has long been known in the industry as a company that produces high performance flash memory products. The Xporter XT Rage doesn’t stray from that reputation. Equipped with Quad Channel technology (4 NAND flash chips are installed inside), the Xporter XT Rage delivers a high read and write performance for a USB 2.0 drive, clocking at 27 MB/s for reads and 25MB/s for writes. While it isn’t exactly marketed as a rugged flash drive, the drive is encased in a rubber coated housing meant to protect it from unintentional abuse. It also has a capless design; the USB connector is retractable, visible only when in use. Additionally, Patriot Memory outfitted the drive with driverless support to make sure that it’s as plug and play as can be on the widest range of operating systems. And as a sign of trust in the drive’s performance, the company backs the Xporter XT Rage with a lifetime warranty. Features like that are hard to pass up at $32. For the curious, Amazon.com is selling the Patriot Xporter XT Rage 32GB at the slashed price. The 8GB, 16GB, and 64GB version also happen to be on sale, a perfect opportunity to exercise your freedom of choice. This entry was posted in Articles, OEM USB flash drive, Patriot, USB Flash Drives and tagged Patriot Memory, Patriot Xporter XT Rage, Patriot Xporter XT Rage 32GB USB Drive, USB 2.0 flash drives, USB 3.0 drives. Bookmark the permalink.